GBP is acting stronger against USD which has been weakened due to the new president’s speech. 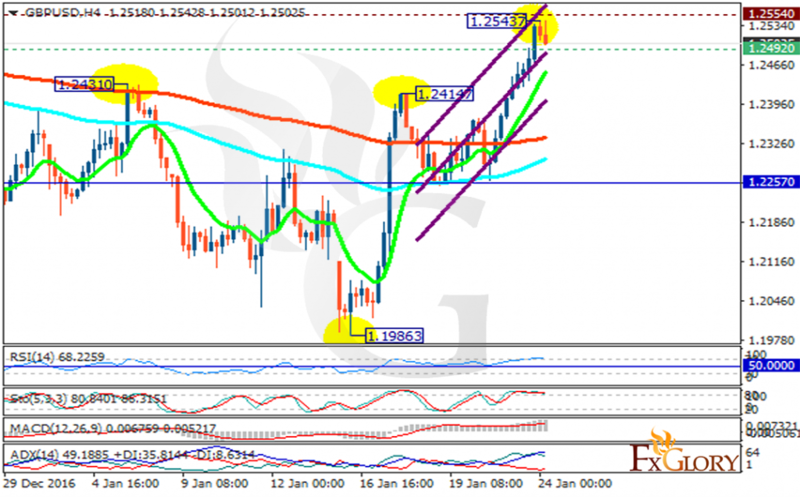 The support rests at 1.24920 with resistance at 1.25540 which both lines are above the weekly pivot point at 1.22570. The EMA of 10 is moving with bullish bias along the ascendant channel and it is above the EMA of 200 and the EMA of 100. The RSI is moving overbought area, the Stochastic is moving in high ranges and the MACD indicator is in positive territory. The ADX is showing buy signals. Bears are taking the control of the chart therefore sellers can target the previous high at 1.24 area.